On January 21, Pascal Rouxelin successfully defended his PhD dissertation, Reactor Physics Uncertainty and Sensitivity Analysis of Prismatic HFGRs. 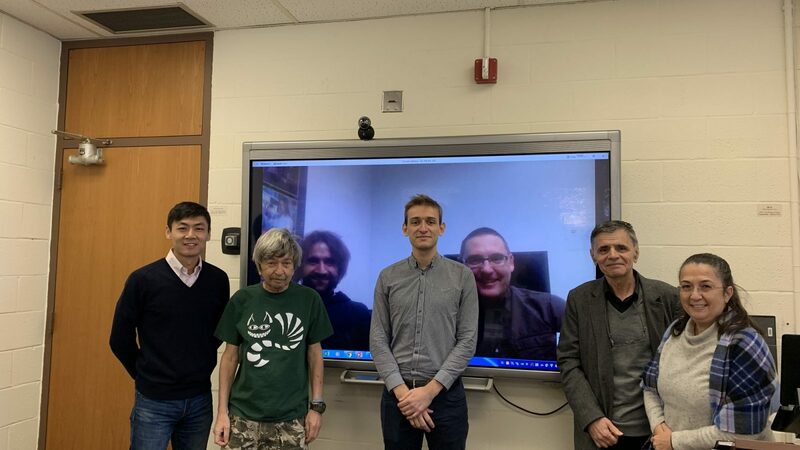 Pascal’s committee consisted of two co-chairs, Kostadin Ivanov and Maria Avramova, and members, Jason Hou, Arkady Kheyfets, and Gerhard Strydom. This work was motivated by the International Atomic Energy Agency that started a Coordinated Research Program (CRP) for the continued elaboration of safety and design attributes of High Temperature Gas-cooled Reactors (HTGR). The growing capabilities of high-fidelity multi-physics, the new features of neutronics and depletion simulations necessitates uncertainty quantification. The efforts of the international scientific community to establish extensive sets of nuclear data library coincide to the appeal to measure and model sensitivities and uncertainties for HTGR applications. The Idaho National Laboratory and the North Carolina State University participate to the International Atomic Energy Agency CRP and fund this research. Hence, the objective of this PhD dissertation is to investigate, develop and improve the uncertainty quantification methods in prismatic HTGRs. Introductory concepts unveil the MHTGR-350, HTTR and VHTRC general specifications pertinent throughout the study, and lists the challenges of HTGR design and simulation. The analysis starts with the elaboration of a methodology to prepare collapsed, problem-dependent cross section with KENO and TRITON/NEWT during depletion calculations for use in the GRS code XSUSA. The methodology demonstrates an automated algorithm to obtain the flux-weighted cross sections for both pebble-bed and prismatic configurations. A second part applies NEWT-generated cross sections in AMPX format to initiate PHISICS/RELAP5-3D multi-physics, core calculations. Super cell models are compared to traditional fuel block lattices defined in the IAEA CRP for HTGR. This analysis assesses the effects of the neutron spectra on multi-physics core predictions for four lattice cells. The influence of the flux-weighted cross sections in the subsequence PHISCS/RELAP5-3D solution proves that the choice of the lattice model impacts the spatial power density of the MHTGR core by ~4 % to 7%. Comparable super cell lattices were utilized to demonstrate the adaptive sampling capabilities of RAVEN associated with NEWT and PHISICS. The sequence, applied to an HTTR two-dimensional core, performs automatic few-group investigations with RAVEN’s Limit Surface Search and Reduced Order Models. Six-group structures were derived. A RAVEN interface was produced for NEWT, PHISICS and RAVEN to avail the cooperative work between the nuclear codes and the probabilistic software. SCALE 6.2.0’s SAMPLER/NEWT code evaluates the uncertainties on nuclide inventories during burnup calculations in two MHTGR lattice cells. The code demonstrated that the cross section uncertainties govern entirely the actinide inventories and the fission yield uncertainties influence majorly the fission product uncertainties. The cross section uncertainties bring a non-negligible contribution to the fission product’s uncertainty component. The spectrum effects from the lattice models are evaluated at about 10% of the total uncertainty. The last section of the analysis transitioned to VHTRC modeling. The RAVEN/PHISICS interface explored its perturbation capabilities to replicate the manufacturing uncertainties stipulated in the VHTRC experimental report. RAVEN/PHISICS predicted output uncertainties for the three VHTRC cores at six temperatures. Although a good agreement is found between the simulations and the experiment, the study highlights the challenges of the interpretation of input uncertainties.